The SunTrust Foundation presents a $5 million grant to the Westside Future Fund to support affordable housing and economic development. Left to right: John Ahmann, Executive Director of Westside Future Fund; Bill Rogers, Chairman & CEO of SunTrust and SunTrust Foundation Chairman of the Board; Atlanta Mayor Keisha Lance Bottoms; Dr. Beverly Tatum, Westside Future Fund Vice Chairman; and Richard Dugas, Westside Future Fund Chairman. 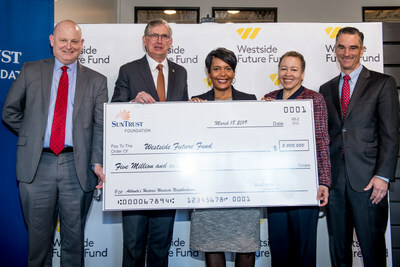 ATLANTA, March 18, 2019 /PRNewswire/ -- The SunTrust Foundation announced today it awarded a $5 million grant to the Westside Future Fund (WFF). The grant will positively impact Atlanta's historic Westside neighborhoods, whose footprint once housed more than 40,000 residents by supporting mixed-income housing and economic development. This will ensure that legacy residents can continue to call the historic Westside home and thrive as part of the revitalization efforts taking place. WFF is committed to establishing mixed-income communities that are safe, support families, stimulate local businesses and ensure sustainability for multiple generations. To do this, WFF's work is framed by a holistic resident retention strategy that prioritizes legacy residents' ability to stay in their neighborhoods for generations while making housing affordable for people of mixed and fixed incomes. The SunTrust Foundation's grant will assist with this affordable housing initiative as well as provide small business support programs to help economic growth within the Westside community. "This grant to the Westside Future Fund is an example of our commitment to Atlanta and our ongoing support of empowering the historic Westside community," said Bill Rogers, SunTrust chairman and CEO and SunTrust Foundation chairman of the board. "The combination of mixed-income housing, meaningful employment and local business growth transforms neighborhoods in a sustainable way, and we look forward to the long-term effect within the Westside. We've seen the tremendous impact that this organization has had on the community, and that's why we chose the Westside Future Fund." The Westside neighborhoods that WFF has identified – English Avenue, Vine City, Ashview Heights, Atlanta University Center, Just Us and Booker T. Washington – represent the areas of greatest need. WFF estimates that among nearly 1,600 households within this footprint, half of the residents earn less than $20,000 a year. Such depressed earnings make it virtually impossible to afford quality housing. The SunTrust Foundation's grant will further the mission of affordable housing and local commerce within these communities. Together, WFF and the SunTrust Foundation will make homeownership achievable for more Westside residents and spur sustainable, increased annual incomes and economic flow within the community. "The outstanding response from our philanthropic partners is allowing us to build a national model that embodies the 'Atlanta Way,'" said John Ahmann, executive director of the Westside Future Fund. "With this charitable pledge from the SunTrust Foundation, we are continuing along a trajectory that will revitalize the Westside and protect its residents." This effort is congruent with the City of Atlanta's focus on supporting small business. With its historic and emerging neighborhoods, Atlanta recognizes that small business and entrepreneurship are crucial to the city's success and equitable growth. Westside Future Fund is a nonprofit formed by Atlanta's public, private and philanthropic partners who believe in the future of Atlanta's Westside and are committed to helping Historic Westside neighborhoods revitalize and develop into a community Dr. King would be proud to call home. WFF serves as a "community quarterback" organization for the holistic redevelopment of English Avenue, Vine City, Ashview Heights, Atlanta University Center, Just Us and the Booker T. Washington neighborhoods. In collaboration with residents, community leaders, and a wide variety of public and private partners, WFF is driving change by focusing on four impact areas: mixed-income communities; cradle-to-career education; community health and wellness; and safety and security. Grounded in a compassionate approach to revitalization aimed at community retention, the organization is focused on creating a diverse mixed-income community, improving quality of life, and elevating and celebrating the Historic Westside's unique history and culture.